The sun was setting on a perfect summer evening as the champagne-soaked Shannon Blues raised the cup. It was a physical encounter, more tactical than thrilling, but the Blues fully deserved to go through to the North American finals. 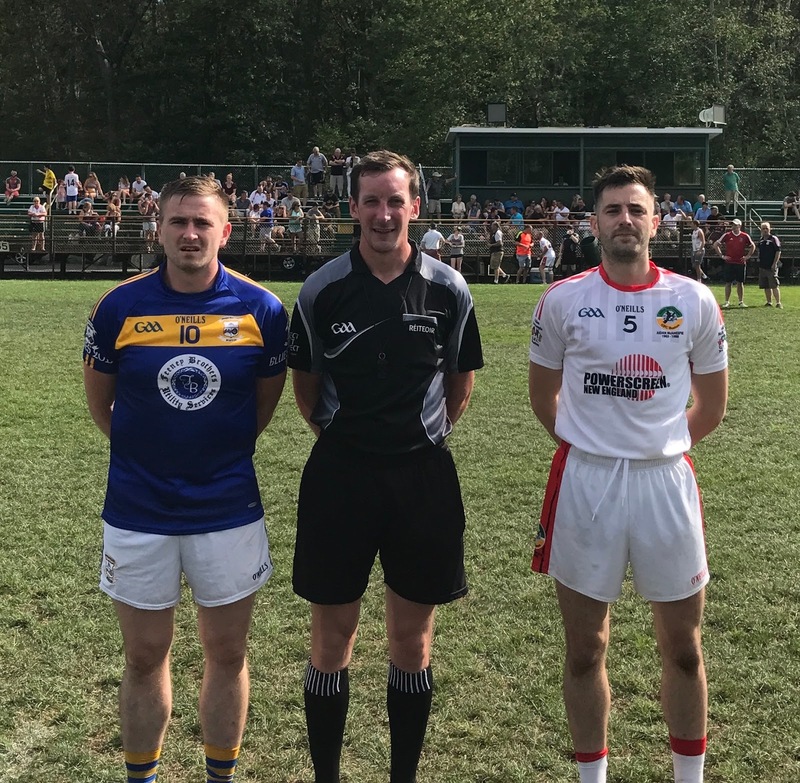 Brian ‘Biscuits’ Kennedy had his charges in shape and in tune for this final, and Boston GAA Chairman John Farrell described him as a legend as he handed over the silverware. Captains Darren Wallace and Eoin Delmer with Pa O'Driscoll. Josh Ryan put one hand on that trophy in the first couple minutes with a flying run straight through the heart of the Macs defense. He picked up possession 50 meters out, put his head down, and charged forward untouched until he roofed the ball into the net for the first score of the match. The Blues jumped on the kickout for another point and the tone was set. Both teams boasted well-drilled defenses and sat back around their own 45 meter lines. There was very little room for attacking mistakes, and every score demanded quick decision making and an even quicker release. The Blues had everyone bar the corner forwards behind the ball, and forced the Macs into hopeful long range efforts. The Macs had the same defensive structure, and equally suffocating man markers, but the Blues were more patient and hand passed their way into frees and better opportunities. The best chances of the first half, for both sides, were on the break, turning the ball over and sprinting forward before the defense had time to set up. For the Macs, Robbie Croft knocked over two points off the ground and Dan McBride split the uprights from beside the corner flag. The Blues saw Kieran Hurley point twice before Brian Fanning carried through a maze of Macs defenders, swerving past shoulder tackles and curling over another point for the Blues. The Shannon men led 1-07 to 0-03 at the break. Kevin Hurley added to their lead shortly after the restart with a gorgeous side step that left his marker grasping at thin air. Hurley hammered his shot just over the bar, then threw over a free after referee Pa O’Driscoll spotted his defender holding him inside. Pat Clifford reduced the deficit for the Macs with a fine point after Robbie Croft stormed up the sideline with two men in his wake, but the writing was already on the wall. It was a muted conclusion in the end as the Blues marched to a 1-15 to 0-11 victory, but don’t tell that to the Blues supporter who lost his shirt in the celebrations. The Macs supporters can hardly fault their team after a brilliant win last week in the semifinal, and they fought bravely till the final whistle of this match as another Canton summer faded into the rearview mirror.